It is not more than fair to say that the 2017 Eurovision Song Contest lineup is far from impressive so far. We know half the songs and there are few things to enthuse audiences or to write home about. If Estonia play their cards right tonight, they could easily become one of the top contenders come May. Twenty songs were whittled down to the final ten that will fight it out in tonight's show. They will be voted upon by the audience as well as the usually totally unpredictable expert jury. The three top placed songs will proceed into a super final where the viewers will have the final word on who is sent to Kyiv. A very good opening number that above all has a captivating verse and build-up only to leap into a disappointingly flat chorus. Like the electropop cousin of "Goodbye To Yesterday", this one has the same advantages and the same weaknesses - a bit more chemistry between the singers wouldn't harm - but as a song this is the best one in the running. Musically talented and sophisticated but a bit too laid-back and a tad too forgettable to be a good choice for Kyiv. As always, this ex-Vanilla Ninja star brings in something good and totally reliable. Maybe she lost something in her switch to English but this is still a most solid entry. Slick voice and slick production in what sounds like a sure-fire radio hit. I'd say it isn't direct enough to work in a song contest where you only have three minutes to impress the audience, but not a bad effort. A slightly stressed feeling and a bit of a risqué wardrobe could work against this one, but if Estonia looks past that there is a good and catchy song performed by a singer who only gets better and better. Should be a contender. Old-fashioned? You bet. 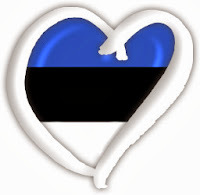 But also well performed by a most beloved singer Estonia has cherished since the 1970's. This could be a surprise in the making but hardly an international winner. The most temperamental rocker in the line-up that would at least kick Cyprus out the window with ease in Kyiv. An outsider but in no way chanceless. A well-written and convincing pop ditty that really would have needed a stronger performance. Young Ariadne is far too polite and insecure to break through the screens, lacking any kind of wow factor. Estonia's own Krista Siegfrids has never been closer to grabbing the trophy for herself than she is this time. Catchy, quirky and very easily accessible. Because she is one heck of a performer and deserves every bit of praise and success. Because it is her turn and she has a better starting position. But this could turn any which way still. Secretly I hope for my top two to be reversed but any of these three could give Estonia a solid placing in Kyiv. And so could Rasmus and Lenna too. Eesti laul begins at 18:30 CET and can be seen online here.